This page lists all the rules in place for building costs. 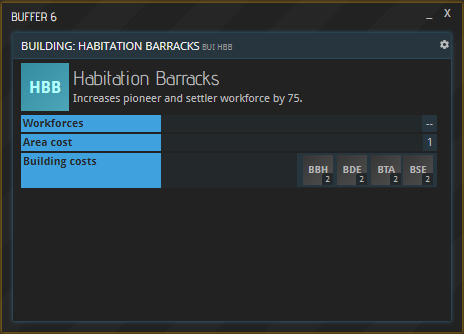 If you would like to know how to set up buildings, have a look at the Base setup page. However, this information only paints a part of the picture. It pertains to this particular base, which is located on a concrete planet. Costs for erecting structures on other planets may deviate based on the set of rules below. Every building needs a certain configuration of Construction Prefabs to be built. On top of that, Construction Materials and/or Construction Parts (“Additional resources” below) will be required once for every building depending on the environmental conditions at hand. The exact number of some additional resources depends on the Area cost of a building, which is indicated in its BUI window (see screenshot above). Please note that all these additional costs also pertain to Planetary projects and Corporate projects. Please note: This commodity is listed under Chemicals, not Construction Materials. Farms and Orchards require a planet with fertile soil to be built.